Please note that the ProVision is an older version of the software. 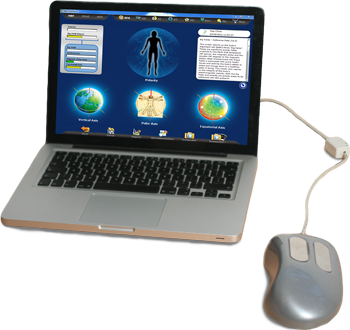 The current version available for sale is the cloud-based BioEnergetiX WellNES System. Also for transparency, this was initially written in 2017 and was based off materials written many years before that. In 2018, I began working for NES Health as the head of training. If you are looking for a quality practitioner today, I encourage you to consider working with my wife through this website. I've been working with NES Health before it was called NES Health, and with their proprietary scanning system before its current version, the NES ProVision. Having owned several expensive alternative wellness assessment systems, this is the only one I kept and always loved. ​The scan happens in seconds (no client fatigue) and can't be manipulated by either the client or practitioner (which can happen with other systems). It also clearly scans a field rather than just electric currents in the skin. You can see this because the scanner can pick up the field before you physically touch the device (as your hand approaches). Most important ... I've always been impressed with its results. Although by its nature it does not show repeated results, you can see similar patterns from one scan to the next in an individual client, and these consistently line up with their physical symptom concerns. I have even gladly scanned skeptics who refused to divulge their symptoms before my assessment (during public demonstrations) and, as I reviewed the overall patterns I saw, they were visibly surprised by the accuracy of the assessment as I picked up on the physical health problems they knew they had. The ProVision assesses the Human Body-Field, which is effectively the command center of the body's chemistry. The ProVision looks at whether this field has enough power and is providing accurate information to the body. It needs both power and accurate information in order to run the body correctly, just like you need power to a computer and software that's working properly if you want to accomplish your goals on that computer. The assessment is shown through several illustrated screens that explain where the body field needs the most support in terms of more energy or corrective information, and both of these are provided by infoceuticals. While you can buy "Feel Good" infoceuticals through this site and use them on their own, most infoceuticals are only available as part of a larger protocol based on the readings of a scan from the ProVision.